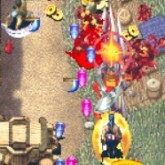 Description: Guwange is an interesting arcade shoot em up where the player plays as a Samurai Ninja. Armed with special magical powers and ninja stars, blast your enemies dead in pools of blood. For a top down shoot em up it has great graphics. Guwange is one of my personal favorite classic Shmups made by Atlus/Cave. Game Controls: Shift Key = Insert Coin. Enter Key = Start. Arrow Keys = Move. " Z, X, C" Keys = Action Buttons. Select the option icons located at bottom of the game screen to edit controls, Play In Full Screen, Save/Load game progress, and change graphics settings.